Uniform numbers aren’t merely a way of identifying players in sports. They can be a game. From there, you can start making up lists. Who is the greatest Sabre or Bill to ever wear a particular number? From there, it’s an easy jump to an All-Western New York team of numbers. That’s what we’ve tried to do here. We’ll go 99 to 0, one day at a time, in the coming months. Some were easy, some were tough. If you play this game yourself, you’ll find out something about the way you rate players. For example, do you value longevity or brilliance? That’s a question that comes up for No. 89, when discussing the merits of Steve Tasker vs. Alexander Mogilny. A similar argument comes up at No. 25, when Luke Easter’s stay in Buffalo is compared to Dave Andreychuk’s. If you think coaching a local team helps an individual’s case, then you probably believe Lindy Ruff deserves to be No. 22. I believe that top college athletes deserve a nod when possible, so they are listed. Some players just don’t fit because they wore two different numbers during their career (Brad May, I’m thinking of you.) 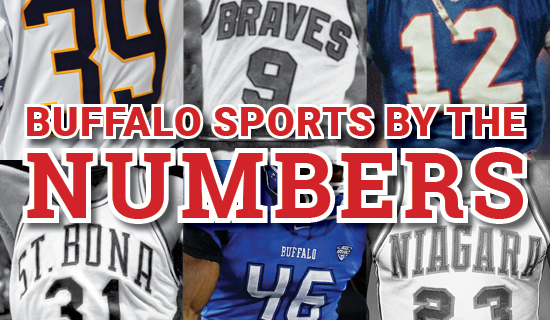 And I’m willing to give extra credit to some obscure Buffalo numbers, like my pick for No. 19. I tried to mention someone from almost every relatively major team that’s called Western New York home. I did something like this more than 20 years ago, and the reactions were fun to read. One guy from Arizona wrote to yell at me for not including more athletes who were well-known before 1960. He didn’t give his age. But yes, the more recent players are more likely to be picked. Here’s an update, freshly researched and written. Feel free to play along – it’s your game too. Kyle Williams, Bills. Here’s one of the great draft bargains in Bills’ history. He was a fifth-round pick in 2006, and has started every game at defensive tackle since his rookie year ended. Williams has become a beloved figure among Bills’ fans, who were thrilled when he finally reached the playoffs last season. Others: Bryce Paup, Bills; Sam Adams, Bills. Coming Wednesday, a Sylvester & Peck on Sports podcast with Budd Bailey breaking down 99 to 90.